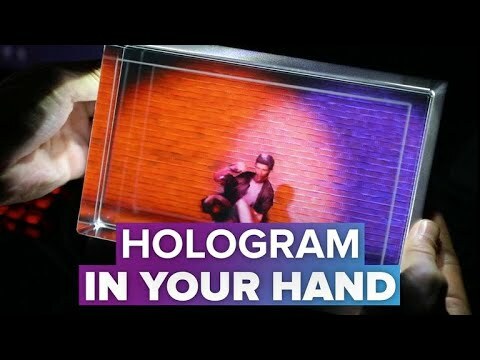 A 3D holographic display built by The Factory. The Looking Glass displays 45 unique interlaced views of 3D scenes at 60 FPS, has an optical film coating to sharpen subpixels. It uses traces to provide front and back depth cues. It also has various optical film layers, protective layers for the the screen and a lenticular lens to distribute 45 different view points to the observer allowing multiple people to view the 3D object at once. A high refractive index material shifts the focal plane. The Looking Glass is compatible with magic leap allowing interaction with the object. It is also compatible with blender, 3D model importer, Unity and comes in 2 models: the 'standard looking glass' with a 8.9" screen and the 'large looking glass' at 15.6". It operates using HDMI and a USB power cable. Looking glass within 48 hours raised approximately $500,000 of pre sales.